Funds raised from event fees and sponsorship goes to the Trust to help us look after Staffordshire's wildlife for the next 50 years. Run for wildlife and go '50 Shades of Green' for Staffordshire Wildlife Trusts 2019 Colour Run event on Sunday 23rd June @ Chasewater Country Park. The fun starts @ 10AM. 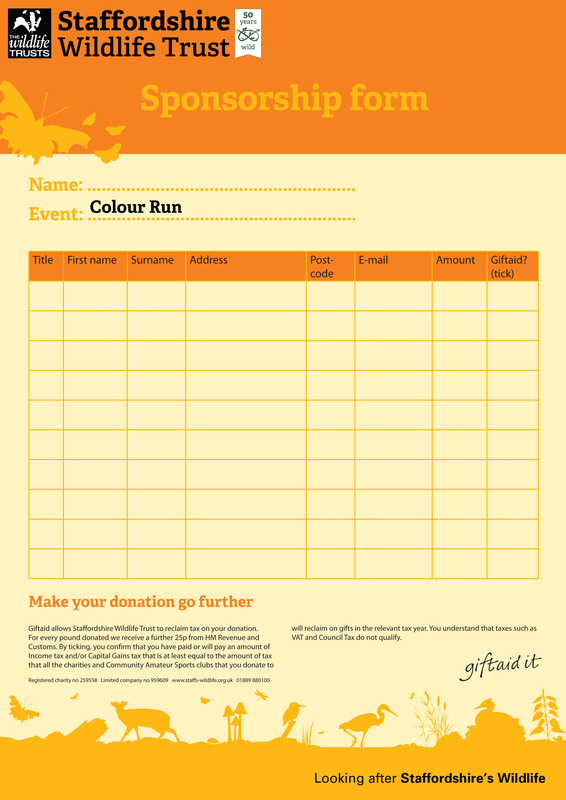 Run, walk or jog 5k for wildlife and stick around at the end for our colour party where everyone gets their own sachet of paint to throw at this! This is a fun event to raise money for your local wildlife and wild places in a stunning location! Directions / getting there: Chasewater Country Park, Burntwood, WS8 7NL. Please note that sometimes sat navs can take people to the wrong side of the water. Chasewater Country Park is signposted from the A5 near Cannock and Brownhills, just south of the junction with the A452 (Chester Road). The South Shore and main car park are both accessed from the A5, Brownhills. Entry is £25 per person.